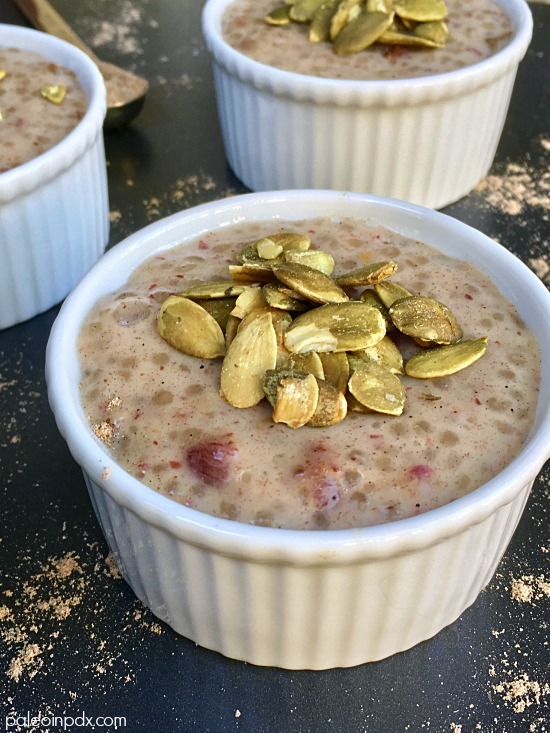 Tapioca pudding is a weird phenomenon. It’s bizarre what those little pearls turn into once cooked (seriously reminds me of tiny clear fish eggs). It creates such a strange, gooey texture that is kinda creepy, yet oddly delicious. This gummy pudding is a little bit of a blast-from-the-past as well. I remember eating it as a kid, though not in its traditional form. My mom used to make some sort of fruit “salad” (one of those that’s not actually a salad in any way, shape, or form) that had tapioca in it and I recall really liking it. But, today, it doesn’t seem like something people really make anymore. I don’t know…maybe it’s lost its luster, but I’m all about bringing it back because this stuff is G-O-O-D! I even enjoy eating a small dish of it for breakfast, but it’s great as a little treat too. Also, know that this version is egg-free, dairy-free, and date-sweetened. It’s full of coconut flavor with just the right amount of cardamom and natural sweetness. I prefer eating it topped with raw sprouted pumpkin seeds for a little crunch, but you can top it with whatever seeds/nuts you like. On another note, less than one week until I head to Poland! Tuesday is the big day and I’m SO excited! Add tapioca pearls and the filtered water to a small saucepan, and let soak uncovered for 30 minutes. Do not drain remaining water, if any. Next, add the coconut milk, chopped dates, sea salt and ground cardamom. Bring to a boil over medium heat and then simmer over low heat for 10-15 minutes, stirring occasionally, until mixture thickens. Remove from heat and cool for about 15 minutes before stirring in the vanilla extract. Serve warm or place in refrigerator to chill and serve cold. 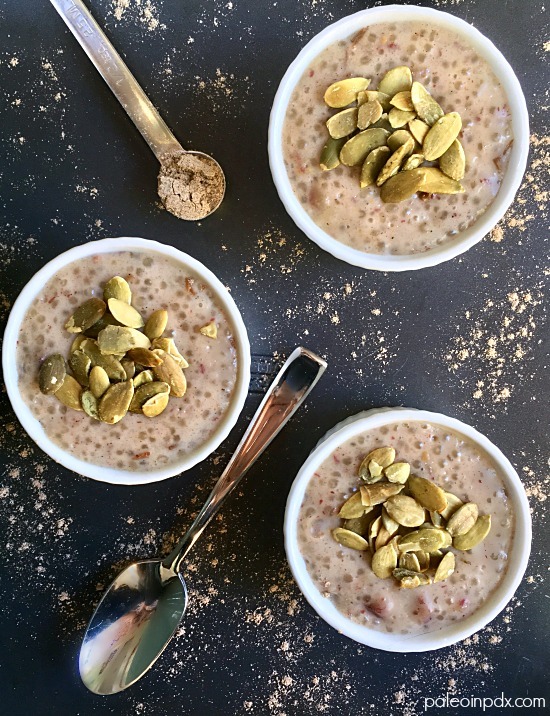 When ready to serve, top with pumpkin seeds or other raw seed/nut of choice. been wanting to work with cardamon more…perfect excuse! !